MANGAL MINERALS – Kutch’s largest mineral manufacturers & supplier of all grades China Clay and Silica Sand. At the global level, we are poised to rise above our number one position. Mangal Minerals, a China Clay & Silica Sand industrial unit, was established in 2009 by the versatile personality Mr. Brijesh H. Gohil and with his fore sight and skilled planning, the unit later on expanded its business. 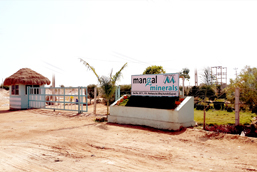 Mangal minerals is sister concern of Shree ram minerals founded by Mr. Manoj Solanki. In Mangal minerals Mr. Manoj Solanki and Mr. Brijesh H. Gohil are partners. Development process is still going on continously under the able leadership of Mr. Brijesh H. Gohil. We ensure that the quality of all our products meet the international standards. To ensure this, our quality checkers keep a strict check on the products right from the procurement of the raw materials to the delivery of our array to the clients. Under the guidance of our founder Mr. Brijesh H. Gohil. we have been able to grow steadily and sturdily over the years. We have a manufacturing unit set up in Gujarat which is spread over a total area of 8 hectors. We also have an application laboratory which continuously focuses on developing suitable grades of products in order to meet industry specific requirements. We owe our success to our primary objective -Customer Delight and Satisfaction - providing the best quality of supplying all grade of China clay & Silica sand. • A safe working environment through accident prevention. • Consistent execution at all levels of our organization. • Integrity and the highest ethical standards. • Mutual respect and trust in our working relationships. • Innovation and encouragement to challenge the status quo. • Communication that is open, respectful, and two-way. • Teamwork and meeting our commitments to one another. • Continuous improvement, development and learning in all we do. • Diversity of people, customers, and ideas. • Performance with recognition for results. • Support for the communities from which we transform resources. providing the best quality controlling R & D department for improving product day by day as per demanding of our valuable customers. Serving with the best “Constistunsy” of service & the foundation of a building with faith to make a future business relationship………. We have a team of dedicated and hard working professionals who are the main assets of our organization. All our professionals have broad knowledge in their respective fields. Moreover, they are trained regularly so that they remain abreast to the latest market trends. It is the conscientious and efficient efforts of all our team members that the origination has gained recognition in the market within a small time period and is delivering high quality products to the clients within the promised time period. We are fully equipped with machines required to accomplish he projects and list of plants and machinery is attached herewith profile. We are fully geared to take up any construction project with a stipulated time period and can mobilize the plants and equipments very quickly. It is well equipped with different sophisticated machines that help in the smooth production of our array all the year round. We also have a full fledged laboratory installed at our plant site for conducting various tests related to our products.